"Emma Frost spent her charmed youth honing her mutant gifts to become one of the world's most powerful psychics. Coupled with her creative flare for manipulation, Emma's powers carried her swiftly up the ranks of the powerful and villainous Hellfire Club. After a devastating attack wiped out her school, Emma joined forces with the X-Men. Despite their antagonistic history, Emma's dedication to educating mutant youth has made her into an unlikely ally." 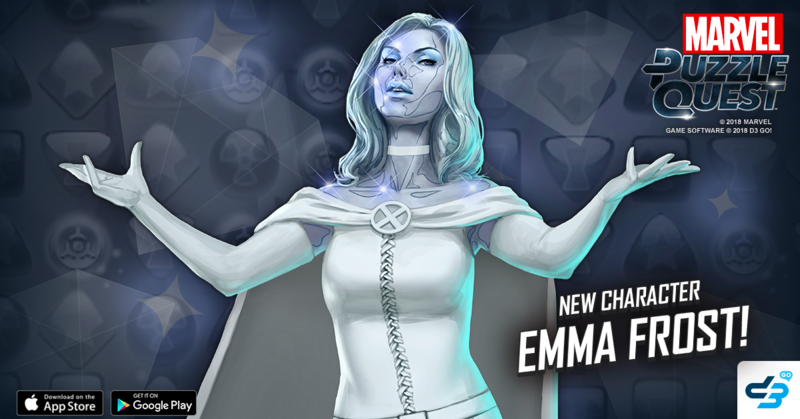 Check out the brand new 4-Star Emma Frost, and find out how you can recruit her onto your team! When the pressure's on, Emma transforms into her powerful diamond form. Fortifies up to 6 friendly Special tiles and turns this power into Diamond Skin. Emma's diamond skin grants her super-strength, but limits her psychic powers. Emma's match damage is increased by 325%, but she cannot fire powers. When there are no Fortified friendly Special tiles on the board, this power becomes Girl's Best Friend. Emma makes sure her team is fully-trained, battle-ready, and appreciative of the merits of lifelong education. Creates a 2-turn Yellow Repeater tile that places 2 strength 90 Strike tiles and improves up to 3 existing friendly Strike tiles by 58.